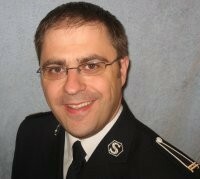 The Solent Fellowship Band (Bandmaster John Bird) was delighted to welcome Bandmaster Andrew Blyth, Assistant Territorial Music Director, to lead a rehearsal on 23 June 2014. Throughout the rehearsal, Bandmaster Blyth demonstrated his significant capability to challenge the band musically, while consistently reminding the group of the spiritual foundations of Salvation Army classics such as The Triumph of Peace (Eric Ball) and In Wonder Beholding (Leslie Condon). Blyth’s skillful interpretation and insight into the music during the rehearsal was much appreciated by the band. This included two newer pieces, Shoeburyness (Eilav Herikstad) and Sweet Spirit of Christ (Paul Drury). Finally, a thoroughly productive evening was completed with a fresh look at some sections of Leslie Condon’s classic festival march, Celebration. This article was posted in News and tagged Andrew Blyth, John Bird, rehearsal, Solent Fellowship Band, special event on 5 November 2014 .